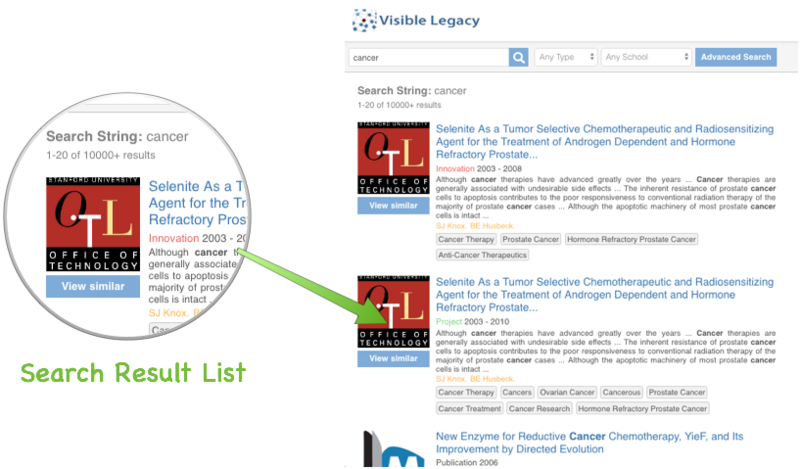 Search is implemented with a powerful set of tools within Visible Legacy Navigator. Basic search is done by familiar keyword or name search and yields a list of topics. Navigator, because it is a graphical representation of a large amount of pre-connected data, gives you further ability to filter results, highlight relevant topics, and navigate to explore information offering context to your results. Quick start: You can get to a Navigator page quickly by clicking a Search Tile at the bottom of the Home Page. These Tiles are topics from a preset searches. These rotate randomly when you reload the Home Page. 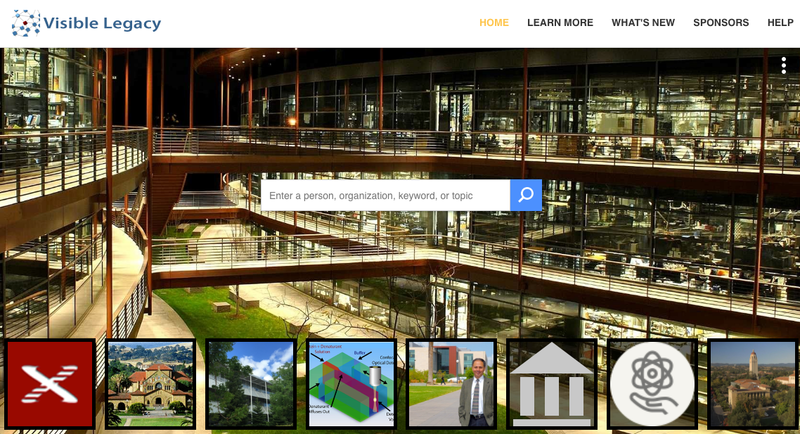 You will see People, Organizations, Papers, Inventions, and News Tiles. The Home Page contains a familiar Search Box. Enter the name of a person or an organization, or enter a keyword or topic. Press enter or click the Magnifying Glass. For example, try entering the topic "Cancer" and press enter. You will get a list of results from a variety of types and schools. These can often be papers or inventions because there are a lot of matches if you don't specify the type of result you are seeking. Ten results per page is the default list length; you can change the number of results per page by changing the URL string or set this default in Account Settings. On the Search Result List page, note your Search term is placed in the in the top bar Search Box. You can enter a search term in the Search List page as well as the Home page. On this page you see helpful filters. Try another search with the term "Cochran". Press enter or click the Magnifying Glass to get a list of related other topics. Now filter the results using the Type drop-menu by selecting Type=Person, click the Magnifying Glass. The results will show just Person topics with "Cochran" found in the name or description. Now filter using the School drop-menu by selecting School=Stanford, click the Magnifying Glass. The results will show just topics of people at Stanford. Side Note: there are also filters in the Navigator page, see Navigator Page Search below. One of the most powerful search tools in Navigator is "View Similar". This feature searches on similar clusters of keywords. In our example, click the "View Similar" button under the record for Jennifer R. Cochran. You will now have a List of results with similar keywords. Continue to Navigate. The keywords are now shown in the search results list. To combine keyword search and filters, use the Advanced Search. From the list of results, click the Topic Title to open the Navigator page for that topic. Use the Map or Detail buttons to toggle between these page views. The Detail Page View is the default page view format; you can set this default in Account Settings. You can use the browser Search in Page to highlight a term by pressing Control+F, or Command+F on a Mac. The term "cancer" is used in the example. Side Note: Use browser in Map view to combine with Tag Highlight. See Using Tags as Filters. The lists of topics have an In List Filter feature. The term "therapeutics" is used in the example. This filters the selected list for topics containing that term in the title or description. The In List Filter is also found in Map View. Use this as a fast way to focus your search. In the Navigator Map view, select "Tags" tab in the Tabs. Use page search by pressing Control+F, or Command+F on a Mac to search for a term such as "therapeutic". 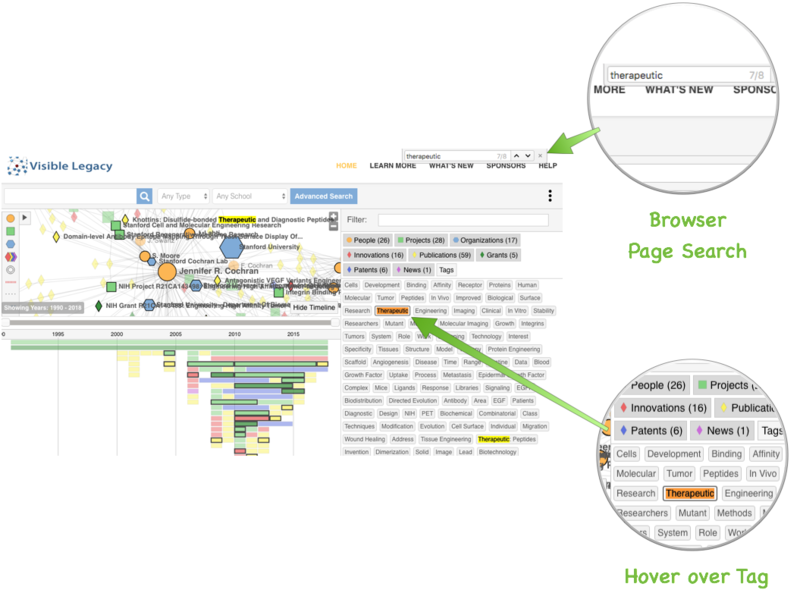 Hover over the Tag button you find highlighted. Notice that all the related Nodes light up and their titles appear This is one of the most powerful modes i Navigator to help you focus your search in the Map. You can, instead, use the In List Filter field above the Tabs in the Map View. For example type "therapeutic" in the Filter. You will see only two Tags found and the entire Map and Timeline display will be filtered by that term so you can focus your search. The roll-over highlight of related topics works as well. If you click a Tag button, Navigator will return a list of topics with that Tag in a Search List. From Navigator, click the Advanced Search button to use the Advanced Search box to create more sophisticated searches. 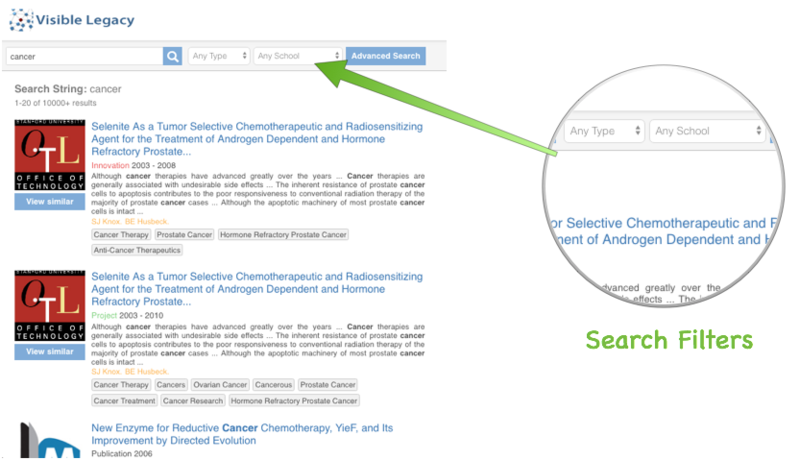 Advanced Search enables searching for topics that match a cluster of keywords and can be filtered to focus your search. In the example shown we entered immune system, tumor cells, drug delivery as a comma-separated list. To filter the results the Type=Innovation and School=Stanford can be added with the drop-menus. Type in the 4-digit Year if you want to limit the Date Range. Try the same search but looking for People instead. To do this from Navigator you click the Advance Search button again and edit your criteria to set Type=Person and click the Search button. You will see a list of investigators instead of disclosures. For more about Advanced Search please see Getting to know Advanced Search. If you want to explore the context of a project or innovation, Highlight Connections may be used to explore the connections. Right-click a Node in the Map, or control click on a Mac. You will see a menu of controls. Now click "Highlight Connections". The lines between the Nodes will illuminated, and the names of the topics shown. You can similarly remove Highlights for one Node or Clear All. Side Note: you can "pin" a node to and pull it aside to expose it better in the map and keep it in place. In our example, Bob Chen is a Postdoc working on interesting projects. By highlighting the connections on the orange node representing him, we see the two projects and a paper he worked on. Continuing to highlight, we see that these projects gain leverage from previous projects in the Cochran Lab funded by NIH and earlier by the Coulter Foundation. It will be interesting to explore where Bob Chen and his collaborators are now by following the links in their detail pages. Visible Legacy Navigator keeps track of your Search steps for the duration of your session. You can use the browser Back and Forward arrows to retrace your steps. To see your Search History, click and hold the back arrow button. 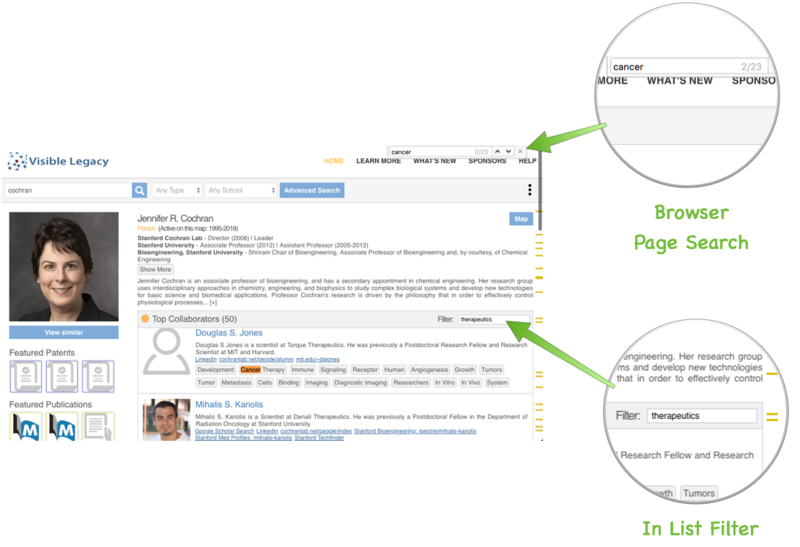 Side Note: you can save a Topic Map or Detail Page by copying the URL. If you sign in to Navigator you will see a heart-shaped button letting you save Topics as "Favorites" into your Account.